Fuchsia is a beautiful shrub or small tree with hanging flowers. Almost all species of this plant the leaves are opposite or whorled. 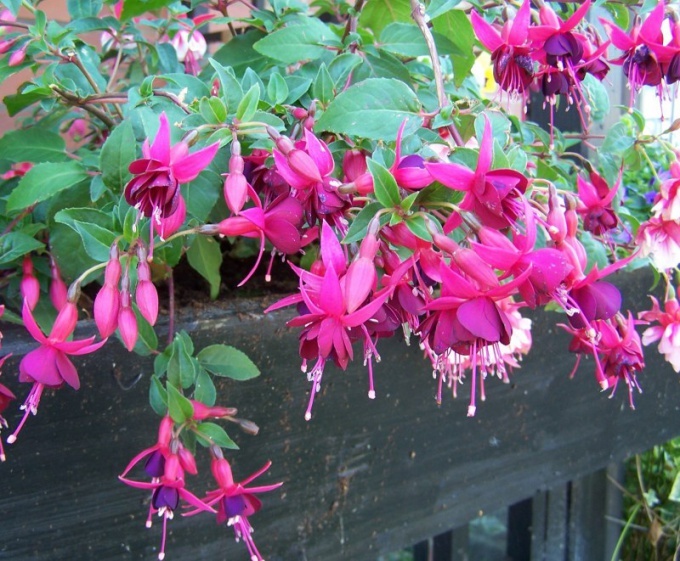 Fuchsia can be grown from seed or as cuttings on the windowsill and in the garden. Despite the fact that fuchsia is quite a common plant - its seeds, in the flower and agricultural stores are not always. But to go to the store where they sell seeds of different plants, still makes sense. It may well be that located near to your house outlet will be what you need. To grow a fuchsia from seed is troublesome, but possible. The best time for sowing seeds in late February or early March. Plant them in the substrate, but do not go to sleep land, plants must germinate in the light. Is better to cover the crops with a transparent film, so that small seeds are not scattered. Sprouts appear in two weeks, they have very carefully covered with earth, to periodically spray, etc. the Probability of germination is very small, and this is the main disadvantage of store-bought seeds. This includes seeds purchased in the online store. In addition, the plant may be not at all like the picture. The fact that the propagation of fuchsias is a very important role pollination. It depends on the shape of a flower. It is very easy to obtain new varieties of fuchsia, but it's quite difficult to fix the desired characteristics. If you really want to start growing fuchsias from seed, contact a nearby flower farm, where dealing with these plants. You can ask for seeds from a private owner. In this case, you can be sure that the seeds are correctly assembled and will give a relatively high germination rate. To find these owners in your city through the community of growers in the social networks. Best fuchsia is propagated by cuttings. With this method of reproduction cannot fix the characteristics of the mother plant. Buy cuttings in flower farm or from private owners. It is possible that they'll just give you these cuttings, because the plant still needs to be updated. Doing this usually every three years, sometimes more often. Cut lignified cuttings, placed for a few hours in boiled water at room temperature, and then planted in the substrate and placed in a hotbed or a hothouse. The substrate need to choose neutral and non-toxic. Roots appear in a couple of weeks. Flower farms sometimes sell cuttings, already rooted, adapted and transplanted into containers. This is the most convenient option for the novice grower. The risk of losing the plant in this case is small, well and carefully to care for it. You can buy saplings in the market, but the best way to do this, for example, at the agricultural exhibition-fair, where they present their products more or less proven manufacturers. You can buy seedlings and directly in the farm.